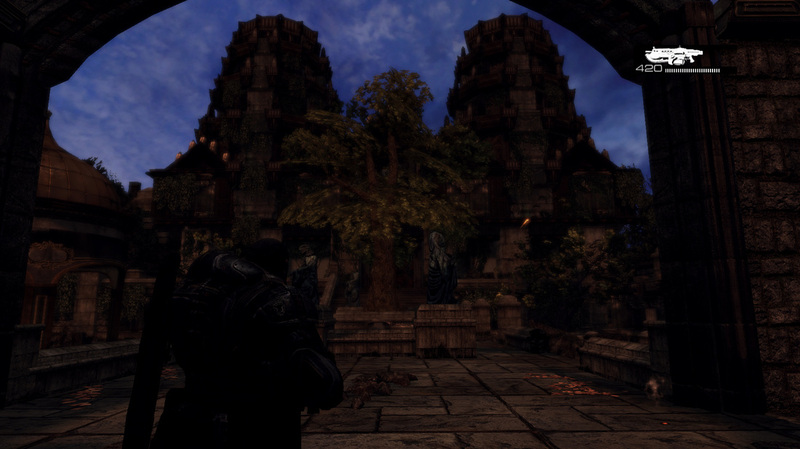 Navigate through an ancient temple as you fight Locust forces and avoid traps. 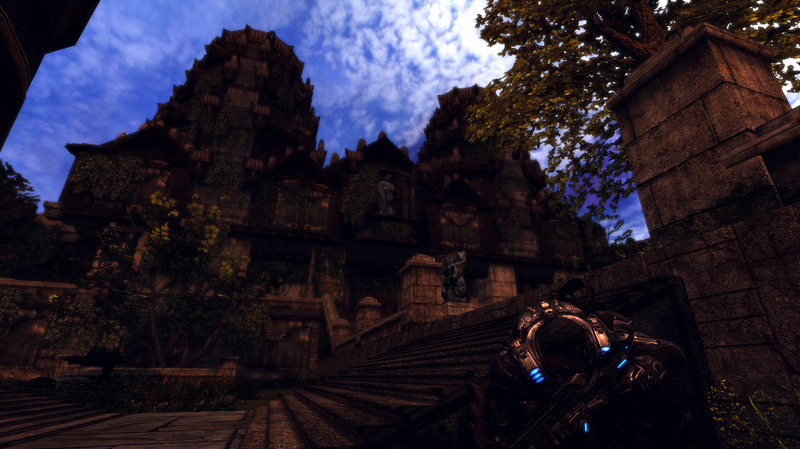 "Withered Pantheon" is a Single-player map designed for Gears of War. The player controls Marcus Fenix, a Delta Squad member of the Coalition of Ordered Government Army, fourteen years after Emergence Day. The mission takes place shortly after completion of the first Gears of War campaign. A small band of COG Scouts are feared KIA outside of the main capital Ephrya. 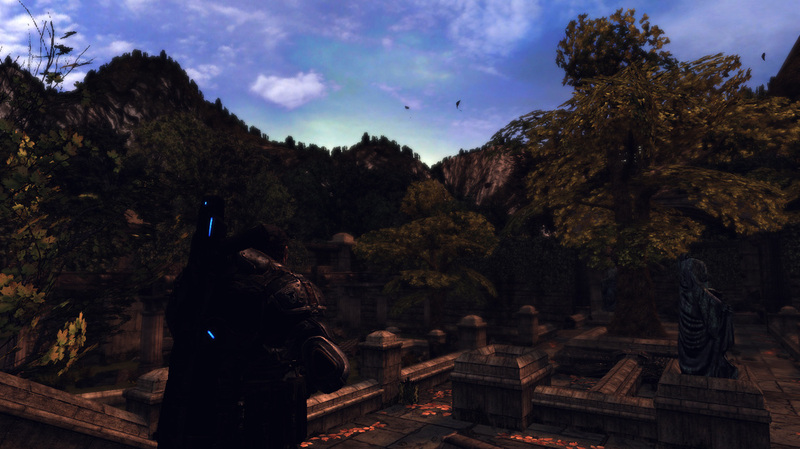 However, the emergency beacons of the scouts mysteriously activate within an ancient ruin. The beacons signal resides not far from where the scouts originally went radio silent, so the possibility exists that they are still alive. 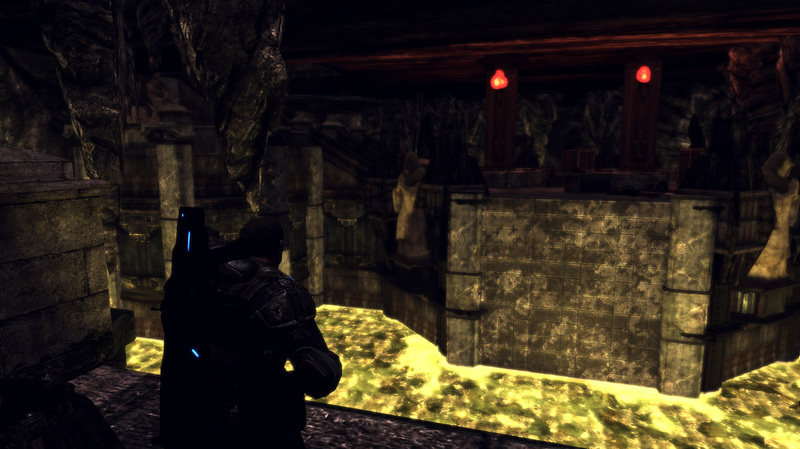 Still, the COG command remains cautious and deploys Marcus to investigate. 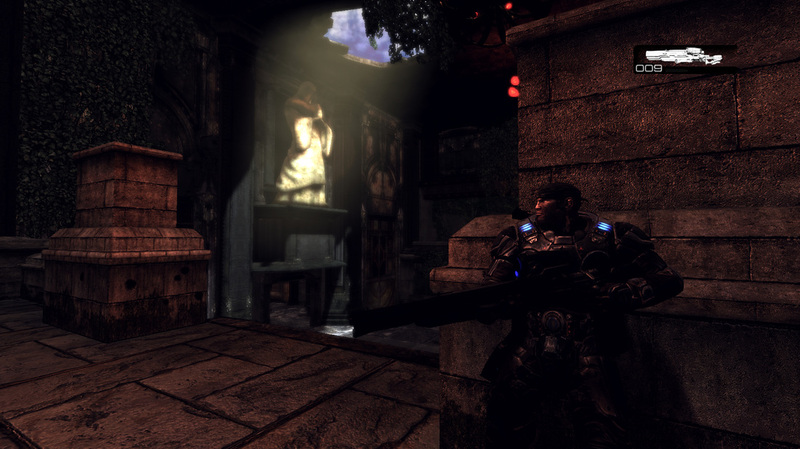 The core gameplay of the Gears of War franchise is close quarters combat with a revolutionary cover system. The Epic team constantly reiterated their goal of building the anti pixel shooter in a market littered with military simulations. Although excited with the challenge of designing traps in an ancient temple, I knew the foundation to a great level for the game was engaging encounters. Shown below are three large encounters found within the level. All with overhead guides to the different stages of the encounters and corresponding videos. 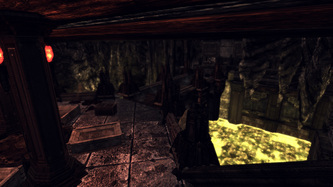 Prior to entry in the first room, the player makes their way across a narrow walkway, encouraging close quarters combat. 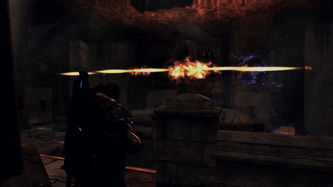 Before reaching the doorway, the player walks across a sniper rifle, preparing them for the longest ranged encounter in the map. Locusts patrol the walkways and take position on the lower level. The player must fight his way across the walkway while using his superior elevation to an advantage on the lower level forces. 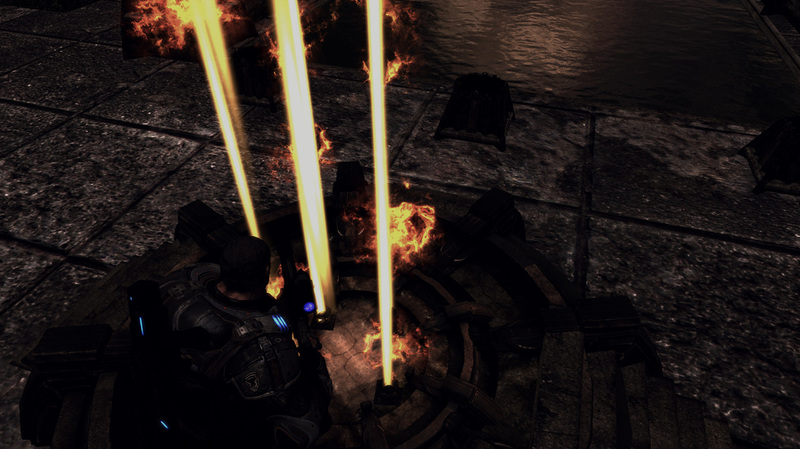 Flaming chandeliers await to be shot down and explode on unsuspecting enemies along with an imulsion canister located at the lower east corner. A Torque Bow resides at the eastern section of the map to reward exploration. The room features a ceremonial pit in the center where the ancient people used Imulsion as a ritual substance. Locust forces approach the player from a hidden entrance connected to the Courtyard. A highly explosive Imulsion canister, developed by the COG Research Team, rests in between the two flights of stairs. The columns and four sacrificial alters provide opportunities for flanking in a close ranged fire fight. The final and most volatile encounter of the level features a Troika Machine Gun with operator, a Boomer and Locust Drone. Play testing showed a high casualty rate whenever players attempted to charge the gunner head on. The best choice is two flanking options to either the north or south. Players must not expose themselves for more than a few seconds to the Troika and not remain stationary due to the Locust Boomer. 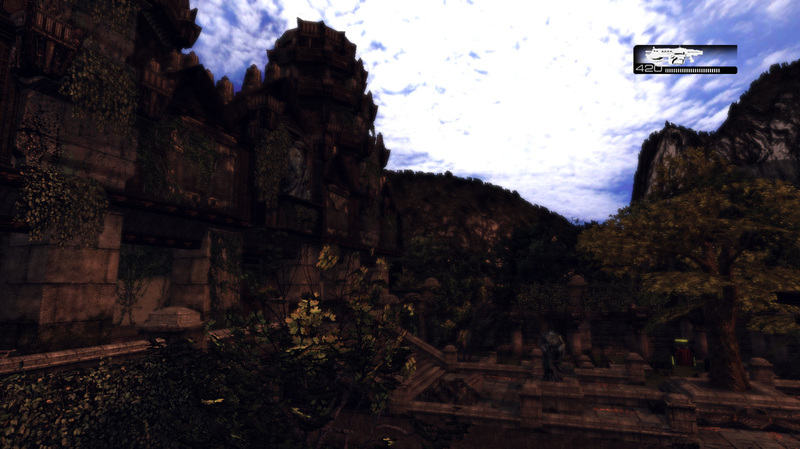 Withered Pantheon features royal tombs and ceremonial chambers of a lost civilization. The temple was built to honor and protect these features at all cost. Spiked walls slam suddenly on unsuspecting victims. Pillars that shoot fire protect the tomb of an ancient king. A royal chamber crushes any subject it does not find suited to be ruler. Although scripting for the spiked walls was relatively simple, communication to the player proved difficult. Early testing showed the first hallway to be a slaughterhouse filled with confusion and frustration. Revisions to the hallway included movement of the blood meshes, testers often ran away from the blood. Strategic angling and placement of debris meshes that encouraged flow to the west of the hallway, giving the players enough time to react. And finally, a single Wretch that runs into the hallway to communicate the player has entered a hazardous area. The room housing the tomb of an ancient king features four pillars that shoot fire in ninety-degree increments. After receiving mixed reviews on communication to the player, I chose a design approach that rewarded observation. I feared adding a matinee or light indication in sequence with the torches erred too strongly on the side of hand holding. Testers that studied their surroundings, saw the flames activation pattern and moved on easily. 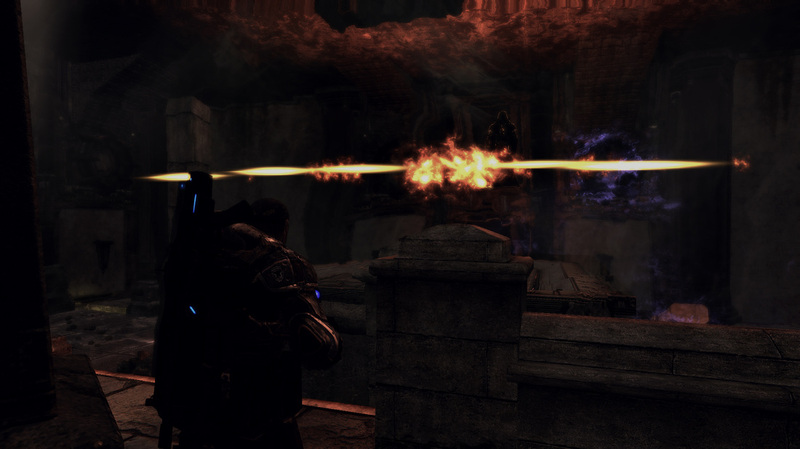 After the players navigate past the torches and open the tomb, they gain access to the controls of the torches. Empowering the player with what was once a hazard and rewarding them with gratifying kills on unsuspecting Locust. 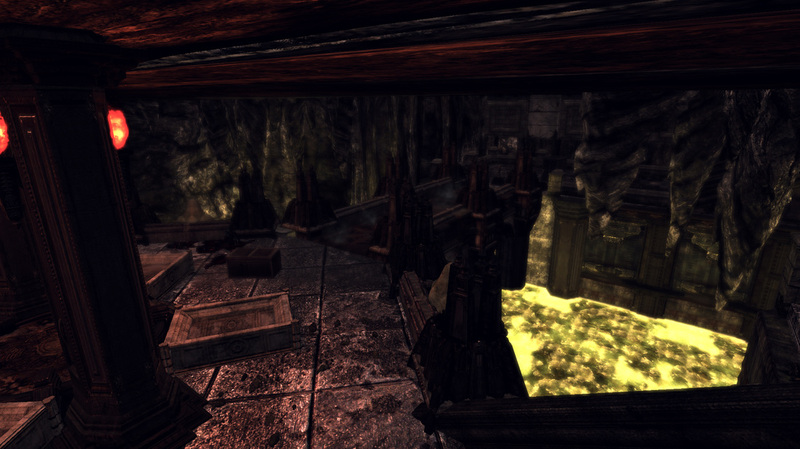 A ceremonial room that harnesses mystical energy to test the character of potential rulers, the Test Chamber requires all who enter to stand on the altar and discover their fate. If a ruler is found to be honorable by the chamber, they can bathe in the water and receive a blessing from the temple. If not, the ceiling begins falling with covered spikes. Unfortunately for Marcus, the temple does not find him a suitable ruler of an ancient civilization. In order to escape the player must complete an order activation puzzle to successfully drain the water and escape.